We are looking here at two of the lenses that Sony produce for the NEX range of cameras, the E 35mm f1.8 and the E 10-18mm f4. The NEX camera’s APS-C sensor has a factor of 1.5x to get the equivalent 35mm focal length making the 35mm into a 52.5mm and the zoom is equivalent to a 15-27mm. Both lenses have Optical SteadyShoot, Sony’s image stabilization system. The E 35mm f1.8 has 8 elements in 6 groups and incorporates ED (Extra Low Dispersion) glass and 2 aspherical elements. The E 10-18mm f4 also includes ED glass in its 10 element, 8 group design and has 3 aspheric elements. In keeping with the way the NEX system works there are no controls on these lenses other than the manual focus ring, which can be used for full manual focus or to make fine adjustment during auto-focus operation. Of course the zoom lens also has a zoom ring. Apart from these rings the lenses are completely bare. The lenses look a little large mounted on a NEX body, but in fact they are a similar size to equivalents from elsewhere. The 35mm weighs 155g and the 10-18mm 225g. 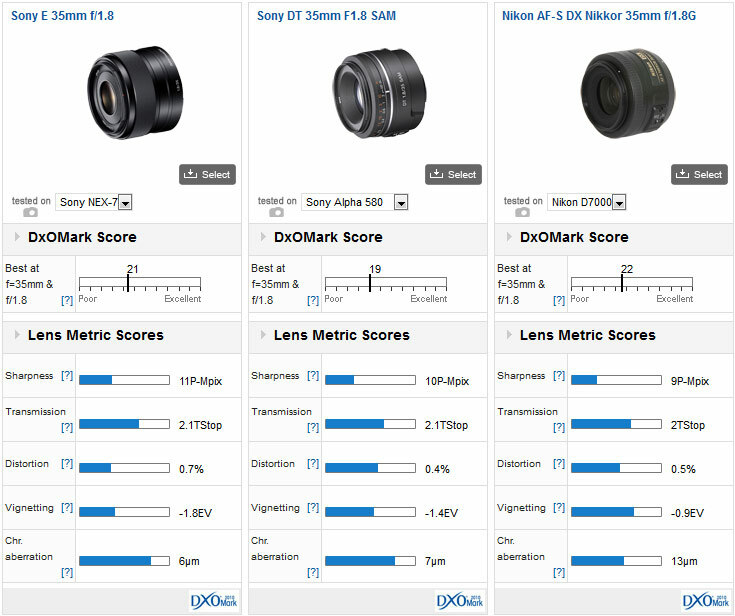 The scores for these two Sony lenses place them exactly in line with equivalent lenses for Micro 4:3. The E 35 f1.8 is a prime standard lens, so you would expect a decent score and it certainly delivers: The DxOMark overall score of 21 makes it equal second best lens on a hybrid camera. Looking at sharpness alone it is equal in first place alongside the Olympus M.Zuiko Digital ED 75mm f1.8. 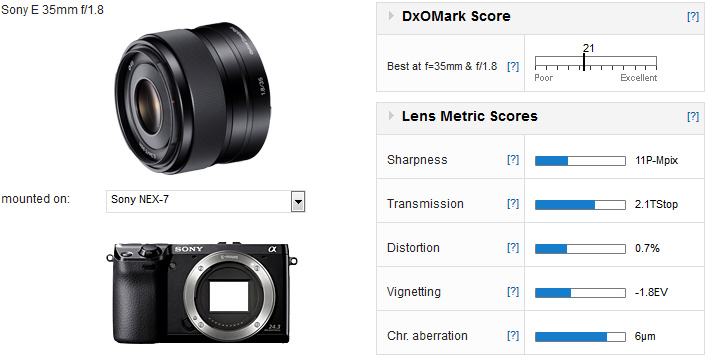 The E 10-18mm f4 does not score quite so high but it does achieve a DxOMark score of 14, which places it right among its peers. 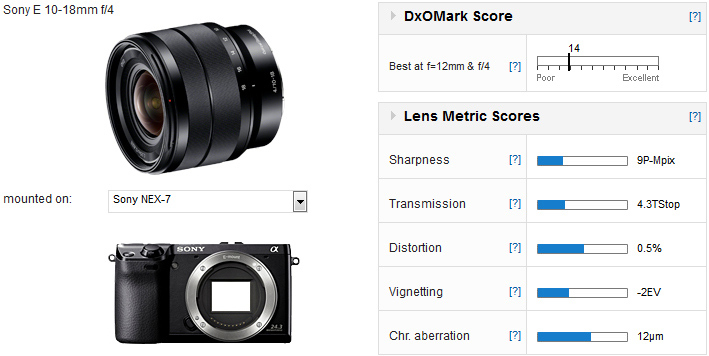 The scores are very close, with a DxOMark of 21 for both. 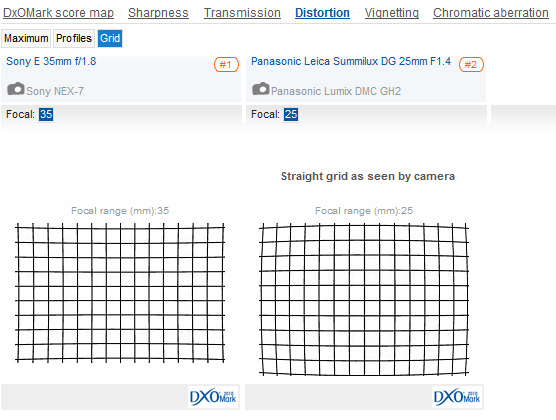 If you own a Sony NEX camera and are looking for a wide angle zoom lens and a standard then these are the two. 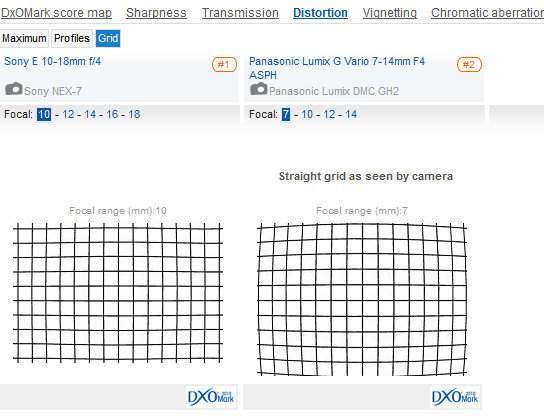 To put their quality into context here are the best similar lenses to fit on a Panasonic Lumix, the Panasonic Leica Summilux DG 25mm f1.4 and the Panasonic Lumix G Vario 7-14mm F4 ASPH. With the slightly smaller Micro 4:3 sensor in the Lumix camera these two lenses are equivalent to a 50mm and a 14-28mm, so a very close match. 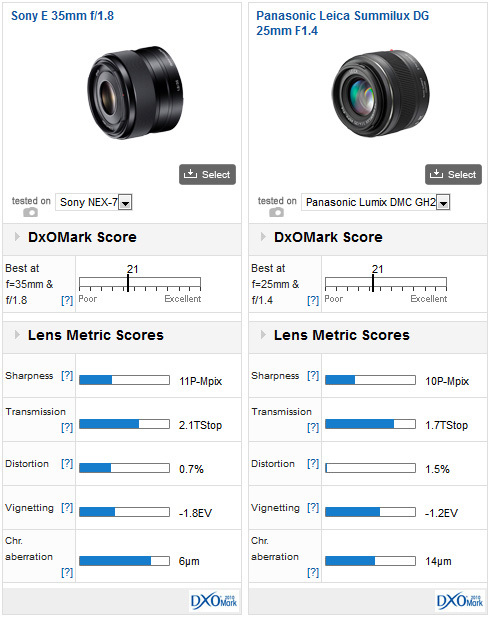 The detailed scores show strength and weaknesses in each lens. The Panasonic Leica Summilux exhibits quite a bit of distortion, more than twice what the Sony lens has and chromatic aberration is not well controlled either, but the Sony lens vignettes quite badly. The comparison between the distortion of the two lenses is emphasized because the Sony lens has a slight pin-cushion and the Summilux a rather pronounced barrel distortion. 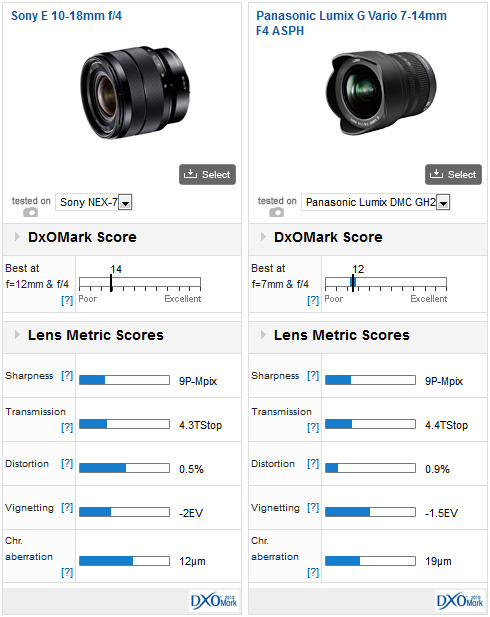 The zoom lenses also score very similarly, with DxOMark scores of 14 for the Sony and 12 for the Panasonic. Sharpness is the same for both at 9 P-Mpix, but again the Panasonic lens is poorly corrected for Distortion and chromatic aberration in comparison to the Sony and again the Sony falls down on Vignetting. 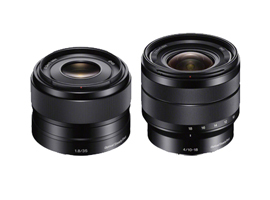 Sony’s 10-18mm lens is close to 30% cheaper; while the zoom range is not quite as wide it seems better value. Like the standard lenses there are strengths and weaknesses for each. The scores are close again, only 3 point separating the lenses. Again each lens has its strengths and weaknesses. For the sake of balance here is a comparison between the E 35mm f1.8 and Sony’s DT 35mm f1.8 for their Alpha cameras and the Nikkor 35mm f1.8 for Nikon DX cameras. All are designed to cover the APS-C format, though the Sony DT and the Nikkor have to work with reflex mirrors which should favor the Sony E lens which will not need to incorporate additional optics to allow for the depth of the body. 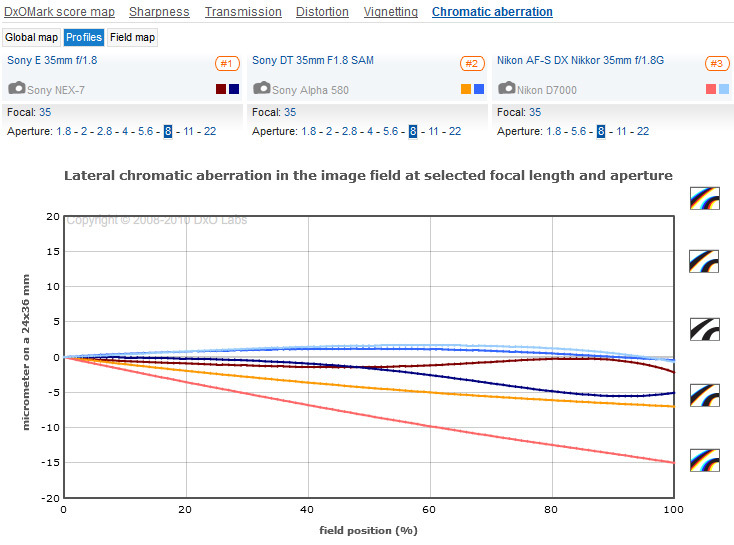 The Sony E Lens is the sharpest and has the least Chromatic Aberration, but bad distortion and vignetting: the Sony DT has the least distortion and is otherwise in the middle: the Nikkor controls vignetting the best but has the worst chromatic aberration. 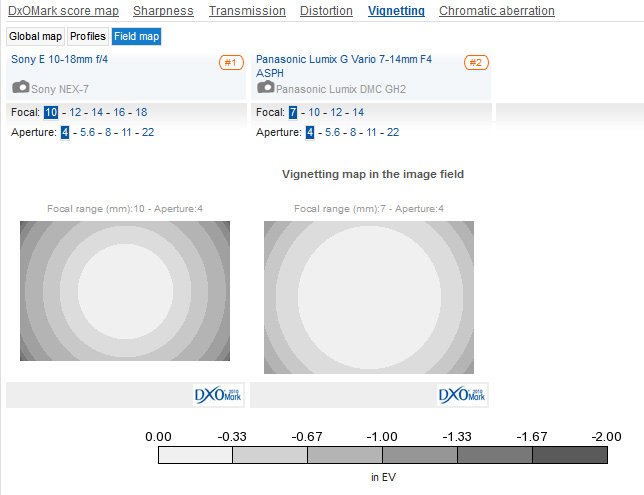 There is no crossover in compatibility between these lenses, if you have a Nikon you know which you need to get. However the comparison does show that the NEX lens stands up well against competitors. It is the most expensive of the three, but it is also the only one with image stabilization. Sony’s NEX cameras are very good, nice big sensors achieving the best results in the hybrid sector. Their lenses, while not perfect, complement the cameras very well.